This low carb skillet cookie is easily one of my favorite recipes to ever go on my blog. It’s extra gooey, loaded with fun birthday cake sprinkles, and has a slightly crisp bottom that crackles when you cut into it. You know what I’m talking about. Looks decent, right? And even better, the entire recipe has just 30 grams of carbs! 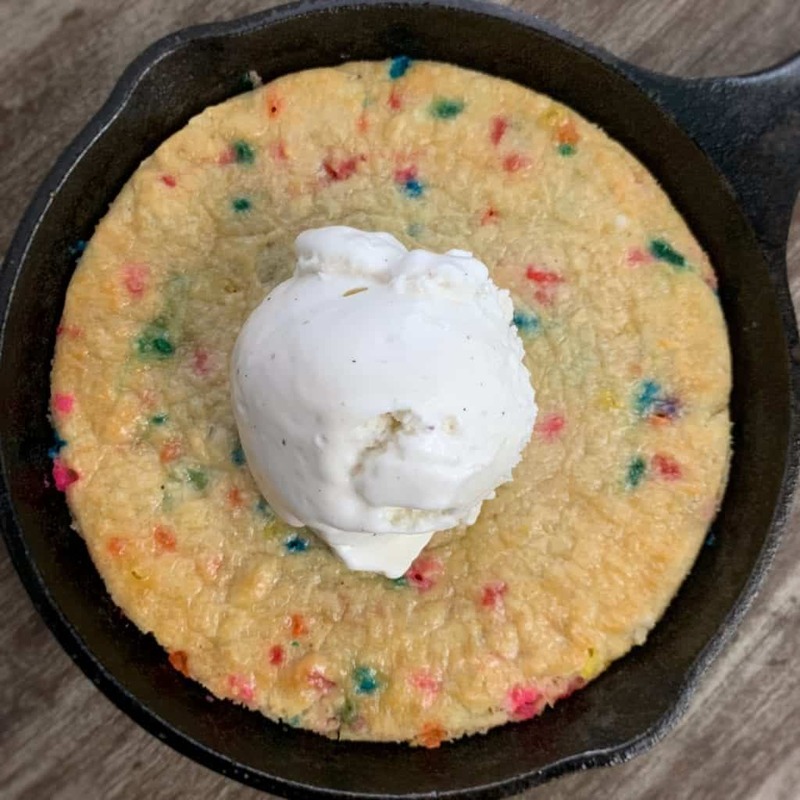 You’ll only need 3 ingredients (and an optional 4th if you’d like more sprinkles) to make this high protein, low carb skillet cookie. There are a few potential modifications for each ingredient that I’ll quickly cover below. Can I Substitute All Purpose Flour for Almond Flour? It’s difficult to find a definitive answer on ratios to use with almond flour for all purpose flour. But in my experience, you can swap them gram for gram in most recipes. In this low carb skillet cookie, for example, I made a second using 3/4 cup all purpose flour that worked beautifully. If you’re thinking of using something like coconut flour, on the other hand, I might caution against it with this recipe. Since coconut flour is so absorbent you’ll need to reduce the amount of flour used or increase the amount of fat and liquid used. Both of these are likely to throw off the texture and density of the cookie (read: dry and tough). What if I don’t have Birthday Cake Protein Powder? 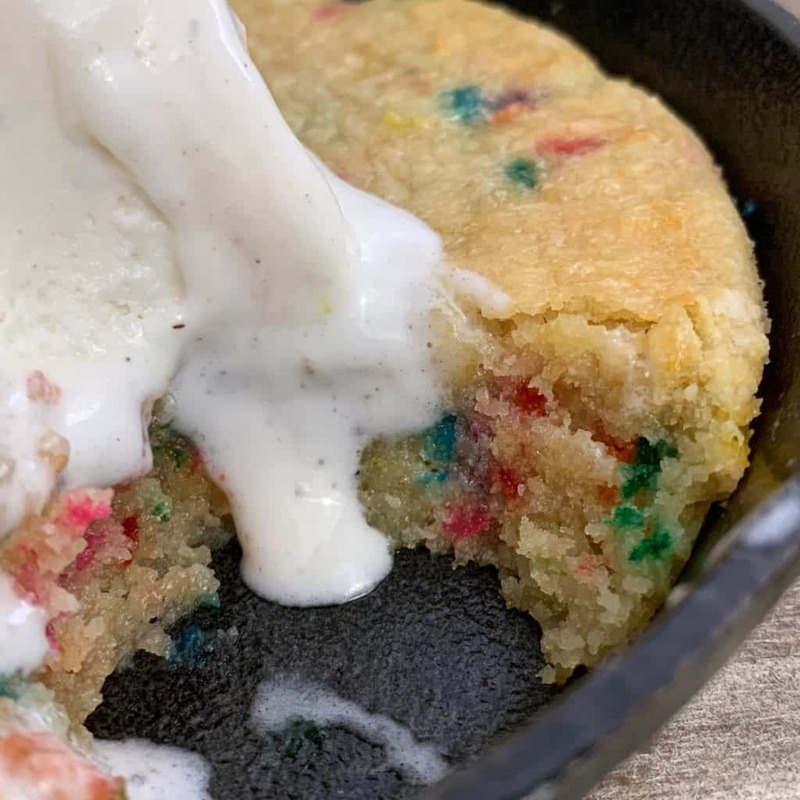 I used Bowmar Nutrition Protein Birthday Cake for this skillet cookie. This protein powder is a whey protein with added rainbow or confetti sprinkles. If you wanted to use a different protein powder, I’d recommend a vanilla. You can add additional sprinkles if you’d like. The most important thing to keep in mind when using other protein powders, aside from the type of protein itself, is scoop size. A scoop of Protein Birthday Cake weighs 28 grams, and you’ll need 3 scoops for a total of 84 grams. If you use a protein with a 35-gram scoop, that’s a 21-gram difference over 3 scoops and will definitely affect the outcome. 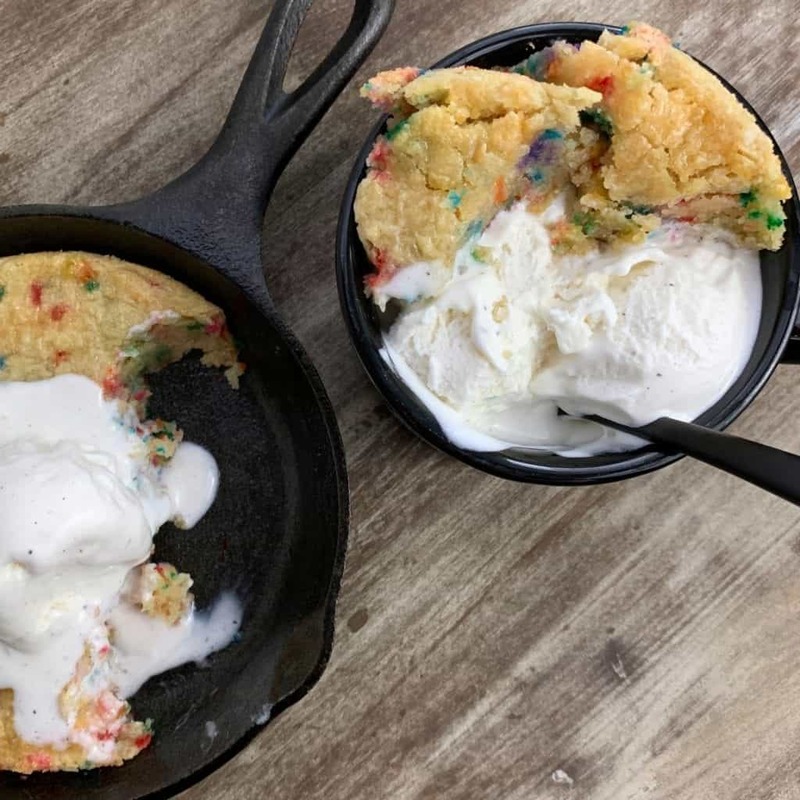 Two skillet cookie re-creations from Instagram! Can I use real butter or another fat? The recipe calls for light butter which has 50 calories per tablespoon as opposed to the 100 calories in real butter. Like any lighter product, the real thing is always better. So if you’re okay with the added fat, go right ahead. You could also swap the light butter for other fat sources, but I’d stick to more saturated sources like a coconut oil or maybe a nut butter (if you wanted to take the flavor another direction). And to lighten things up, you could try using unsweetened apple sauce for some of the butter. You’ll sacrifice a bit of the tender, gooey finished product, but that’s a sacrifice that might be worth making for a lower calorie option. I topped my protein skillet cookie with some lower calorie ice cream. When it comes to lighter ice creams, I don’t love the high priced options that are marketed as healthy ice cream. Something like Edy’s Slow Churned Ice Cream or even generic store brands frozen yogurt will have similar calories per serving. You may sacrifice a few grams of protein and some added carbs per scoop, but I’ll leave that up to you! 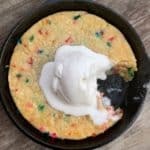 Fat free whipped topping also goes great with this low carb skillet cookie, and that’s a much lower calorie topping than ice cream. Let me know what you think about this low carb skillet cookie by taking a pic and tagging me on Instagram @mason_woodruff. Or you can join my free Facebook group and share it with the Proton Party. 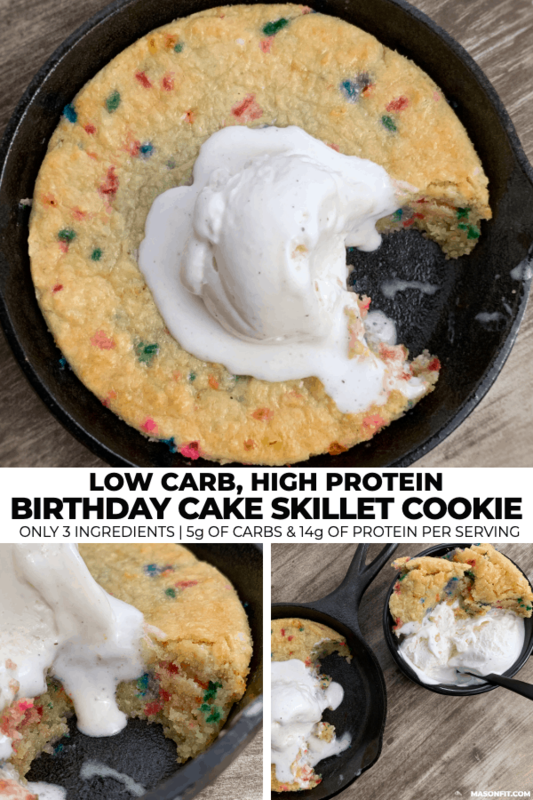 A 3-ingredient gooey skillet cookie made with almond flour and birthday cake protein powder. Preheat oven to 350F and spray a 6.5” cast iron skillet or oven safe pan that’s similar in size with a bit of nonstick cooking spray. Mix the flour and protein powder together before adding the butter. If you’re using real butter or really cold light butter, you’ll want to soften it first for easier mixing. Fold in additional sprinkles if you’d like. 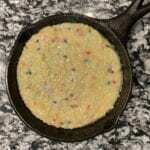 Add the cookie dough to the skillet and use a rubber spatula to spread it to the edges and smooth the top. Top with some ice cream or low fat whipped cream and dig in. Nutrition facts include optional sprinkles but no ice cream or other toppings. If you'd rather use all purpose flour, swap it gram for gram with the almond flour. You can find the skillet I use on my Amazon list. 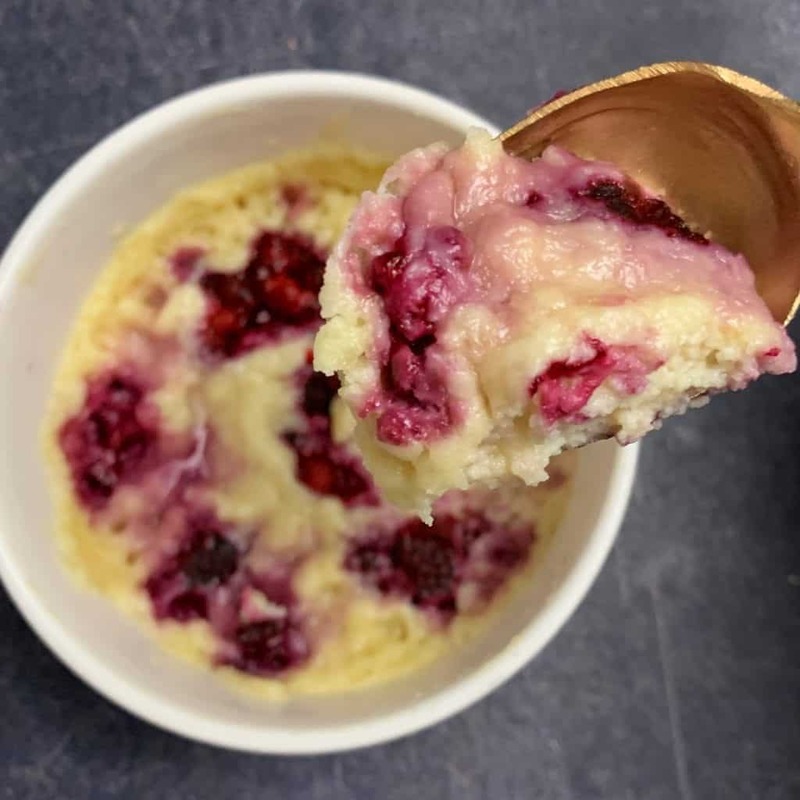 If you’d like a cookie recipe that’s much quicker than this skillet cookie, you’ll dig my almond raspberry low carb mug cookie. It has 28 grams of protein, 9 grams of carbs, and is ready in less than 5 minutes. 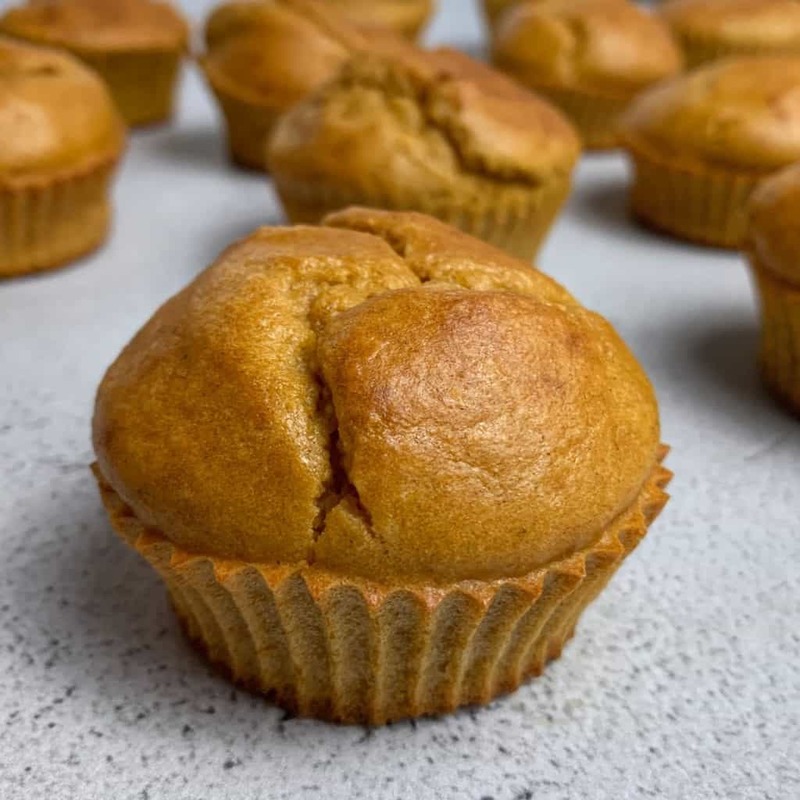 And if you’re a fan of muffins, my low carb pumpkin muffins are a reader favorite with just 6 ingredients. Currently cutting weight for CPU Nationals…. This recipe made my life so much easier!!!! Had multiple times a week for dessert. Great sugar fix and very easy to make! Make sure not to over cook because they get very crunchy if you do. 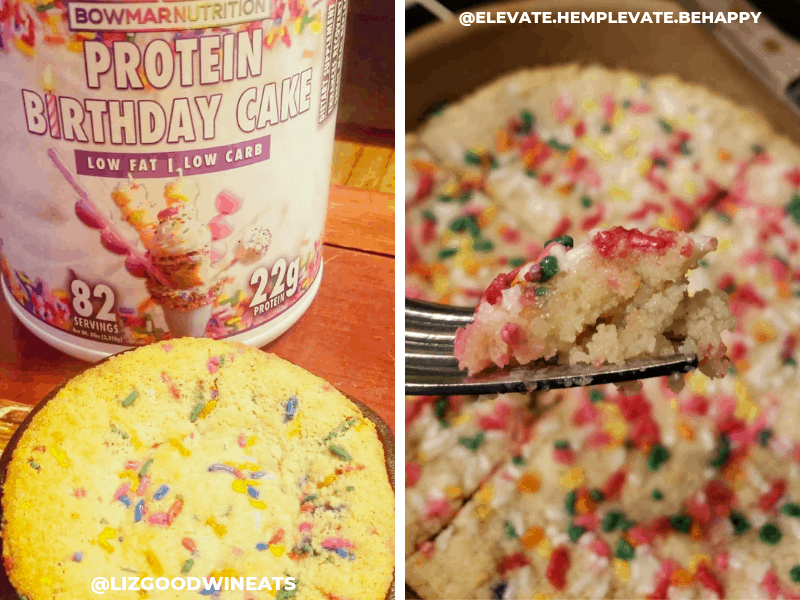 I love love loved this recipe once I used the birthday cake protein from Bowmar. I tried it with a Vanilla protein powder I had on hand while i was waiting for my Bowmar protein to arrive. It was dry and grainy so I was a bit discouraged. But once I switched up the protein it was soooo good. I substituted unsalted grass fed butter . This recipe is like the famous “pizookie” or pizza cookie that is very popular at a restaurant chain near where I live, which is what drew me to this recipe. Add a scoop of halo top ! . Mind Blown! This is a must! Pairs well with FF Whip Cream and Low Cal, FF, Halo Vanilla Ice cream! “I DID IT ALL FOR THE COOKIE” – A Protein cookie in a skillet? skeptical? TRUST ME…Don’t knock it till you try it! 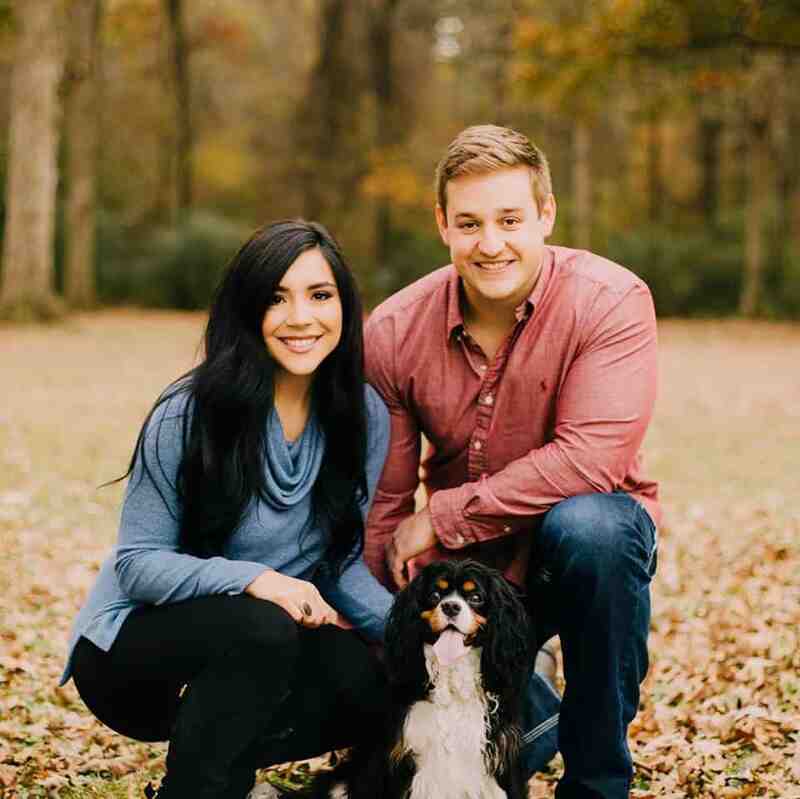 My husband and I committed to a “get healthy together” journey about a year ago. As we make progress and are seeing gradual and sustainable results, I have stepped up my game in the kitchen (with Mason’s help) to create healthier versions of tempting treats and descendant dishes. 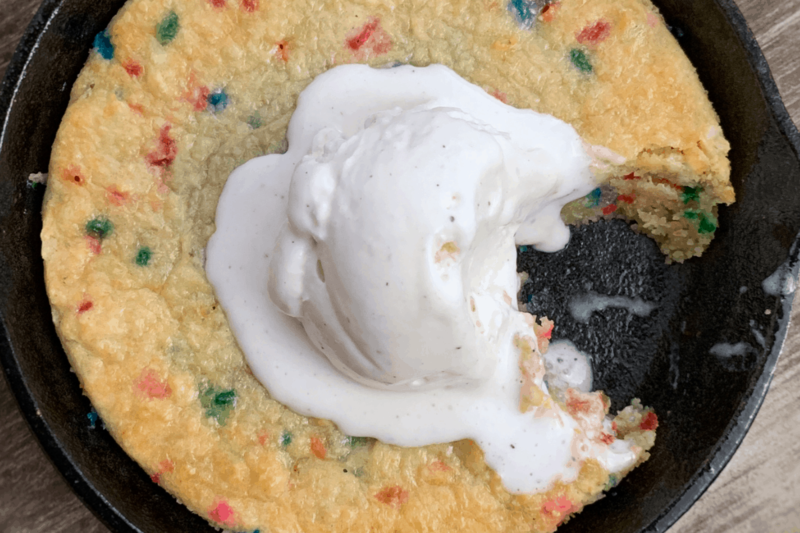 When I made this skillet cookie…the entire house filling with an amazing that put sugar cookie candle to shame. Once out of the oven, we couldn’t wait to try it and WHOA IT IS AH-MAZING…so much so that it has become a weekly staple for our sweet treat snacks. It keeps well after cooking for days and travels well in our cooler bags. I HIGHLY RECOMMEND you give this recipe a go! Made this with Bowmar Blueberry Cheesecake. Soooo good! Thanks again for yet another hit! I made this with bowmar nutrition protein frosted cookie and it was delicious! Thank you for the great easy recipe. I haven’t actually made this whole recipe yet, but I did use it to make edible protein cookie dough using Bowmar protein (PFC was better than PBC), light butter, and almond flour. Kind of fat-spendy, but yum! I just did it and it was perfect. I loved it. Thank you!